Weight alone is not a clear indicator of good health. To distinguish between pounds that come from body fat and those that come from lean body mass or muscle you need to measure them to determine fitness. Carrying too much fat is a condition called obesity, and puts you at risk for many serious medical conditions including heart disease, diabetes and even certain forms of cancer. In fact, obesity contributes to at least half the chronic diseases in western society today. 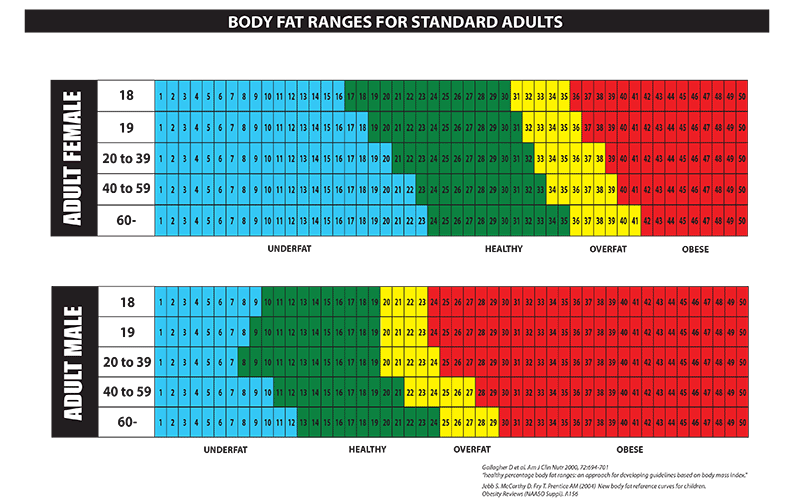 This is considered one of the most reliable and accessible methods of screening body fat. In conventional BIA, a person is weighed, then height, age, gender and weight or other physical characteristics such as body type, physical activity level, ethnicity, etc. are entered in a computer. While the person is lying down, electrodes are attached to various parts of the body and a small electric signal is circulated. Simply explained, BIA measures the impedance or resistance to the signal as it travels through the water that is found in muscle and fat. The more muscle a person has, the more water their body can hold. The greater the amount of water in a person’s body, the easier it is for the current to pass through it. The more fat, the more resistance to the current. BIA is safe and it does not hurt. In fact, the signal used in body fat monitors cannot be felt at all either by an adult or child. Woman have more body fat than men–about five percent more. By nature, a woman’s body is developed to protect her and a potential fetus. As a result, women have more enzymes for storing fat and fewer enzymes for burning fat. Additionally, the estrogen women have activates fat storing enzymes and causes them to multiply. Women experience more changes in hydration levels than men because of their menstrual cycle, and this can affect body fat measuring, particularly using the BIA method. Retaining fluid may also cause weight to fluctuate day-to-day during this period causing additional variation in the body fat percentage. Female users of BIA products should be aware of their natural monthly body cycles. To establish a baseline for monitoring body fat, many women find it useful to chart their readings every day for a month. Afterward, monitoring at regular intervals can anticipate monthly fluctuations. To successfully monitor progress, women should remember to compare weight and body fat percentage measurements taken under the same conditions over a period of time. Pay attention to fluctuations caused by menstruation. And stay within the Women’s–not the Men’s–Healthy Body Fat Range!